Join us as we find ourselves a cable car to race (and beat) in our favourite monthly San Francisco tradition – The Great Cable Car Chase. 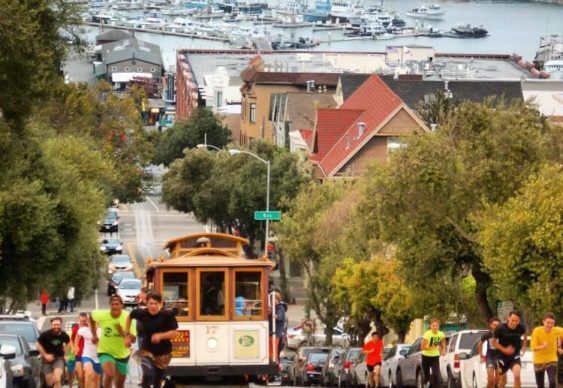 We’ll be racing the Powell/Hyde cable car on Hyde Street from Bay to Chestnut in two blocks of uphill running and careful pacing. We’ll also have a raffle back at the shop afterwards. Meet up at A Runner’s Mind San Francisco on (3575 Sacramento St) at 7 pm, then run to Bay and Hyde at a relaxed pace (about 2-2.5 miles) to wait for the next cable car to arrive. After the Chase we’ll run back to the shop and have the raffle. It’s totally free, too – just come ready to show up those San Francisco cable cars and hills.